The glaring issue is the concentration on the top of the funnel vs. the bottom of the funnel. The sales industry has been running around screaming “But how do I close these leads?” And the marketing automation industry does not seem to be listening. They just keep giving us more and more technology to capture and push better and better data – and then we spend bazillions of dollars to implement the technology, go through internal turmoil as we re-organize teams to use the technology and find ways to close sales, and then only close 1-6% of the names we elicit! We are wasting over 90% of the leads we capture from technology!! Don’t get me wrong. Marketing automation is great – fabulous, brilliant – at the top of the funnel. We get a bunch of email addresses and some names. But these are Names. That’s it. Names. They may or may not be leads. They may or may not be prospects. Names. In the old days, we used to buy lists, or make cold calls. And we closed 7% of our sales — abysmal, but certainly more than we’re closing with marketing automation (companies claim to be closing 20%, but they track from an appointment or connect… which assumes the 90%+ folks who don’t respond never needed your solution). Where is the technology to help us follow and influence the behind-the-scenes, private, idiosyncratic decisions and considerations buyers must address before they can buy? 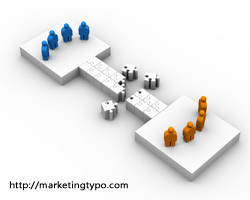 I failed to find tech partners to add decision facilitation technology to marketing automation. Every company I called – Marketo, Eloqua, Manticore, Leadformix, Pardot – agree they have no way to manage the names they collect, other than do lead scoring, lead nurturing, or handing them over to a telemarketing group. One industry leader – Carlos Hidalgo – won’t even entertain the notion that there is something trackable and supportable at the internal behind-the-scenes, pre-sale portion of the buying journey. In an email to me he wrote: “I do not see buyer following an approach where they get all of the internal items checked-off before engaging a vendor or a sales process.” He knows neither the full set of systems issues prospects must address before considering a new solution (which are codifiable and can be influenced to bring in prospects who didn’t think they were ready), nor the full set of private internal issues they must manage after a potential vendor is engaged (where we lose our sales) and before they actually buy. It’s possible to actually support and influence every activity that buyers must go through off-line as they work through the necessary internal buy-in, relationships, and change management issues necessary for them to make a purchase. In my latest book – Dirty Little Secrets: why buyers can’t buy and sellers can’t sell and what you can do about it – I lay out a systems thinking list of non-need related ‘to-dos’ that buyers must address – like putting together a Buying Decision Team, or addressing potential change management issues, or getting agreement, needs, and ideas from everyone who will touch the solution. Imagine if your technology could enter the buying decision earlier. Imagine if while you were collecting names, you were turning them into leads. Imagine if you began offering your prospects service before you contacted them. Imagine if when you made contact, they already had their full Buying Decision Team on board and a whole team were ready to meet you. Imagine if you closed 30% of YOUR ENTIRE POPULATION OF LEADS rather than just the 1% that end up falling out the bottom. Marketing automation is capable of far more. Its vision – mirroring the short-sighted, solution-focused sales model – is just too limited. And you and your prospects are suffering the consequences. By thinking beyond the sales model into the change management model that occurs prior to buyers being able to buy, your digital selling vendors can develop a way to enter and manage the behind-the-scenes buying journey earlier so the leads you get are already qualifed. Call them and yell. Or call me and we’ll discuss it. Read some of my articles in my ‘digital selling‘ group. See what’s possible. I bet between us we can enhance the industry to ensure that you close a lot more sales.